Hello, folks. Welcome back to Bad Beats, the column you visit for betting advice and sad tales of gambling woe. Read past Bad Beats here. Got any stories for us? Email us at tips@deadspin.com. Subject: Bad Beats. We're all losing, no matter who you had last night. I had OKC -4 and watched as the lead eroded along with with Durant's ability to shoot and Russell Westbrook's ability not to shoot. If you had Dallas in the game, or in the series, you're probably pretty perky today. But maybe you shouldn't be. 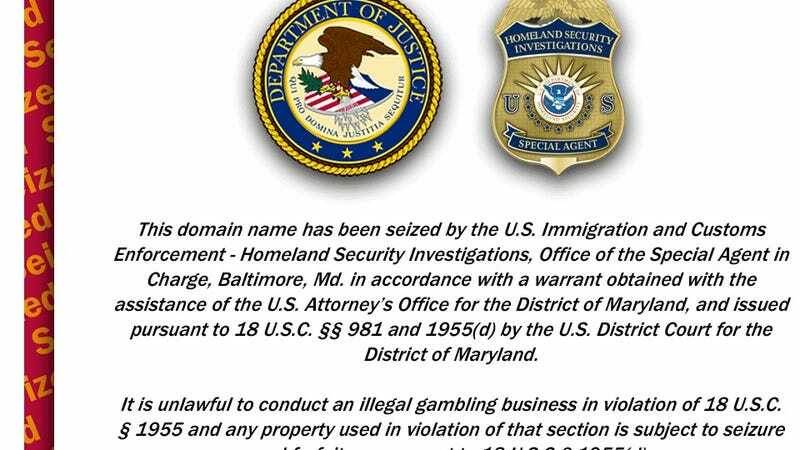 Last night, the US Department of Justice seized ten domains—some poker, some sports—including Bookmaker.com, one of the bigger (and better) online sportsbooks, and DoylesRoom.com, a poker site known for its longtime affiliation with hat-wearin' Texan Doyle Brunson. The immediate lesson is that online sportsbooks and poker rooms won't be able to use .com domains. More importantly, though, we learned that federal law enforcement is digging in for a long fight with offshore gambling websites. The feds found the backdoor bankers for these sites all over—in Panama, Malta, Portugal, and the Netherlands—but say that all sites needed some payment processing in the US. Accordingly, the Department of Homeland Security set up a phony payment processing business (called "Linwood Payment Solutions") that handled millions in transactions over two years for several of the leading poker sites and sportsbooks. This was an old-fashioned sting operation—your tax dollars at work funding a fake company, with several employees as part of its legitimate-seeming operations. They went to meetings, wearing wires, the whole thing. Then again, perhaps the mission pays for itself: the Baltimore City Paper reported in 2010 that federal gambling seizures had netted $30 million in two years. But if some of that money is in your online account, that's probably cold comfort. Michael Garone, who was charged with laundering money on Bodog's behalf in 2008, was recently named as an informant in an "extensive undercover operation." Given that Garone's involvement with the feds ended in November (when his case was unsealed), it seems a safe bet that he was involved with the Linwood undercover operation. Garone eventually received one year's probation on the money-laundering charges. One payment processor charged on Black Friday has already pleaded guilty and agreed to cooperate with authorities. Bookmaker also has a new offshore site—bmaker.ag, an Antiguan and Barbudan domain—and American-friendly wagering again. They too declined comment. In the interim, you should only worry about having to learn a new web address for your bookmaker. Yet it's apparent that Homeland Security has started and will continue to chase the sites around the globe. If you're the nervous type, make sure your online bankroll is somewhere you can get to it quickly. Don't let slick web design and Verified by Visa fool you: We still have a foot in the Old West. TONIGHT: Consider the Sharks +155, the Bulls +5, and, if you really like dogs, Kirstie Alley at 8/1 to win Dancing With the Stars. I am in college at the University of Illinois circa 1987-1991 when I get my first taste of serious sports gambling (for a college student with limited funds that meant betting $50-$100 a game a couple of games a week). It is Monday Night and I am chasing a very bad Sunday. The Los Angeles Rams with Jim "Chrissy" Everett are 2 1/2 point home dogs to the San Francisco 49ers. I like home dogs on Monday night so I pound em. Rams look great from the kickoff and take a 17 point lead into the 4th quarter with me up 19 1/2 points and celebrating. Joe Montana proceeds to throw 3 TD's including 2 90+ yarders to score 21 in the 4th and covering. I was never the same again which is probably a good thing as it got me off serious sports gambling even as I got older and had more cash to lose. It was my worst beat. I never really bet on anything, conventional or unconventional, until I went to college in 2003. It was in my freshman dorm that I met a guy named Bill (name changed to protect againt anyone figuring out who would take the other side in the most morbid bet of all time). Bill introduced me to the practice of gambling on everything and anything...over/unders on the length of a road trip, who could sink the most putts from one end of the dorm hallway to the other, how many shots I could take before booting, etc. We started off betting money, but Bill had the habit of satisfying his debts by estimating the market value of items he owned and substituting them for cash. Because it's not really fun to use the headphones your buddy gave you to settle a bet right in front of him, we eventually decided to bet only in increments of liquor/beer. My initial reluctance to make bets soon gave way to a crushing gambling addiction, and by the fall of our sophomore year the bets we made with each other were becoming increasingly absurd, which leads to the bet I made on October 9, 2004 (significant for reasons very soon to be revealed) that prompted me to write in in the first place. While sitting around the table getting hammered that night, I innocently stated that I was confident Christopher Reeve would walk again. Bill, seeing the opening I'd provided, immediately asked me if I cared to wager on it. I told him that I was confident enough to bet a case of beers that the man who played Superman would walk again within one calendar year, and Bill quickly accepted the bet. Cut to the next morning, when I'm woken up with a text from Bill telling me to pay up that case of beers I owe him. My fuzzy brain, still waking up, was slow to make the appropriate connections, but sure enough after about 2 seconds on the Internet it had been confirmed...Christopher Reeve died on 10/10/04. It's been 7 years and I still can't shake the nagging thought that somehow my terrible betting luck finished off Superman. Courtesy of Paddy Power, what will David Cameron's first cliché be during Prime Minister's Questions on 8 June? Oh, there's really only one choice for us. Although "massive deficit" isn't a bad longish shot, either.